The demands on protection of modern machines and plants electrical and data cables are steadily growing in all industries. With the Heavy Series Over Braided Flexible Conduit and Heavy Series Fittings from Delikon, you can cover all Automation cable protection requirements while benefiting from maximum efficiency, flexibility, and cost effectiveness. In both control cabinets and system cabling, the key factor in achieving high availability of your electronic system is secure and failsafe connection of all components. Therefore, you need Delikon as a reliable single source partner who can deliver modern, efficient and well laid out flexible conduit and connector systems. 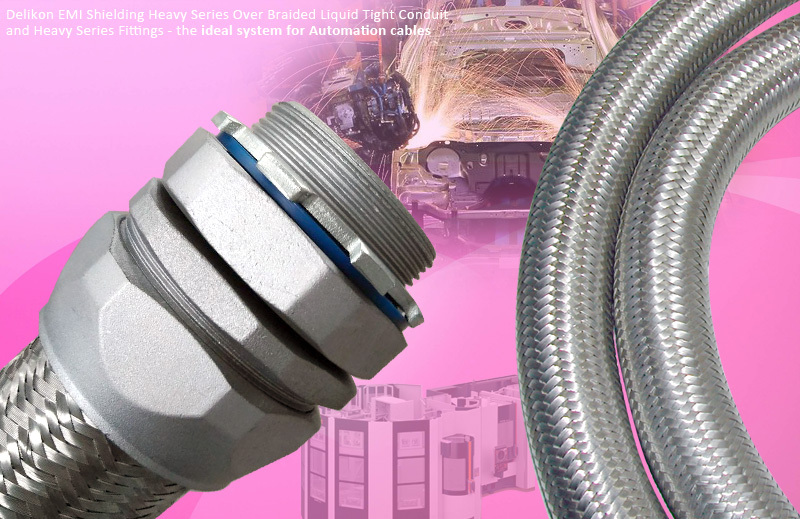 With Heavy Series Over Braided Liquid Tight Conduit and Heavy Series Fittings, Delikon delivers a complete EMI shielding liquid tight range of connection technology for the Automation Systems.